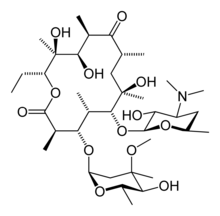 Erythromycin is a macrolide antibiotic produced from a strain of the actinomycete Saccharopolyspora erythraea, formerly known as Streptomyces erythraeus. It is an antibiotic that has an antimicrobial spectrum similar to or slightly wider than that of penicillin, and is often used for people that have an allergy to penicillins. The term erythromycins is used for a group of antibiotics that include not only erythromycin but also those chemically related to or derived from erythromycin, such as azithromycin (Zithromax) and clarithromycin (Biaxin) (Ross-Flanigan 2004). Erythromycins are prescribed for a wide variety of infections caused by bacteria, including pneumonia, strep throat, bronchitis, ear infections, urinary tract infections, and tonsillitis (Ross-Flanigan 2004). For respiratory tract infections, erythromycins have better coverage of atypical organisms, including mycoplasma and Legionellosis. They also used to treat outbreaks of chlamydia, syphilis, acne, and gonorrhea. Erythromycins do not work for viruses, such as the common cold or influenza. Erythromycin represents one of the many helpful drugs derived from nature—in this case, a drug used to kill or impede the growth of bacteria that actually is derived from a bacterial strain itself. Erythromycin belongs to a group of drugs known as macrolides. The activity of macrolides stems from the presence of a macrolide ring, a large macrocyclic lactone ring to which one or more deoxy sugars, usually cladinose and desosamine, may be attached. Macrocyclic refers to a cyclic macromolecule or macromolecular cyclic portion of a molecule, commonly any molecule with a ring of more than nine. 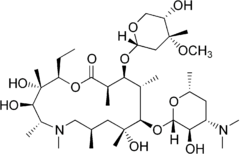 The lactone rings of macrolides are usually 14, 15 or 16-membered. In structure, erthyromycin is a macrocyclic compound containing a 14-membered lactone ring with ten asymmetric centers and two sugars (L-cladinose and D-desoamine), making it a compound very difficult to produce via synthetic methods. Its chemical formula is C37H67N1O13. Erythromycin is available in enteric-coated tablets, slow-release capsules, oral suspensions, ophthalmic solutions, ointments, gels, and injections. It is manufactured and distributed by Eli Lilly and Company. Brand names include Robimycin, E-Mycin, E.E.S. Granules, E.E.S.-200, E.E.S.-400, E.E.S.-400 Filmtab, Erymax, Ery-Tab, Eryc, Erypar, EryPed, Eryped 200, Eryped 400, Erythrocin Stearate Filmtab, Erythrocot, E-Base, Erythroped, Ilosone, MY-E, Pediamycin, Zineryt, Abboticin, Abboticin-ES, Erycin, PCE Dispertab, Stiemycine and Acnasol. These drugs are all chemically related, and with similar uses, but are distributed differently in the body and may find different applications. Azithromycin and clarithromycin are better than erythromycin at reaching the lungs and respiratory tract, and thus are preferred for respiratory tract infections. Clindamycin are more effective than erythromycin for treatment of infections caused by anaerobic bacteria (ones that grow in the absence of oxygen) (Ross-Flanigan and Uretsky 2005). The mechanism of action of the macrolides is inhibition of bacterial protein biosynthesis by binding reversibly to the subunit 50S of the bacterial ribosome, thereby inhibiting translocation of peptidyl tRNA. This action is mainly bacteriostatic (hampers the growth of bacteria), but can also be bactericidal (kills bacteria) in high concentrations. Macrolides tend to accumulate within leukocytes, and are therefore actually transported into the site of infection. Likewise, erythromycin may possess bacteriocidal activity, particularly at higher concentrations (Trevor et al. 2005). The mechanism is not fully elucidated however. By binding to the 50S subunit of the bacterial 70S rRNA complex, protein synthesis and subsequently structure/function processes critical for life or replication are inhibited (Trevor et al. 2005). Erythromycin interferes with aminoacyl translocation, preventing the transfer of the tRNA bound at the A site of the rRNA complex to the P site of the rRNA complex. Without this translocation, the A site remains occupied and thus the addition of an incoming tRNA and its attached amino acid to the nascent polypeptide chain is inhibited. This interferes with the production of functionally useful proteins and is therefore the basis of antimicrobial action. Erythromycin is commonly used for individuals who have an allergic reaction to penicillin, although penicillin has advantages in its ability to kill bacteria. Sometimes erythromycin is used to address a microorganism that is resistant to penicillin (Ross-Flanigan and Uretsky 2005). Erythromycin is easily inactivated by gastric acid; therefore, all orally-administered formulations are given as either enteric-coated or more-stable laxatives or esters, such as erythromycin ethylsuccinate. Erythromycin is very rapidly absorbed, and diffuses into most tissues and phagocytes. Due to the high concentration in phagocytes, erythromycin is actively transported to the site of infection, where, during active phagocytosis, large concentrations of erythromycin are released. Most of erythromycin is metabolized by demethylation in the liver. Its main elimination route is in the bile, and a small portion in the urine. Erythromycin's elimination half-life is 1.5 hours. The macrolide antibiotics erythromycin, clarithromycin, and roxithromycin have proven to be effective as long-term treatment for the idiopathic, Asian-prevalent lung disease diffuse panbronchiolitis (DPB) (Keicho and Kudoh 2002; Lopez-Boado and Rubin 2008). The successful results of macrolides in DPB stems from controlling symptoms through immunomodulation (adjusting the immune response), with the added benefit of low-dose requirements (Keicho and Kudoh 200). Erythromycin inhibits the cytochrome P450 system, particularly CYP3A4, which can cause it to affect the metabolism of many different drugs. If CYP3A4 substrates, such as simvastatin (Zocor), lovastatin (Mevacor), or atorvastatin (Lipitor), are taken concomitantly with erythromycin, levels of the substrates will increase, often causing adverse effects. A noted drug interaction involves erythromycin and simvastatin, resulting in increased simvastatin levels and the potential for rhabdomyolysis. Another group of CYP3A4 substrates are drugs used for migraine such as ergotamine and dihydroergotamine; their adverse effects may be more pronounced if erythromycin is associated (BCFI). Gastrointestinal disturbances, such as diarrhea, nausea, abdominal pain, and vomiting, are fairly common, so erythromycin tends not to be prescribed as a first-line drug. However, erythromycin may be useful in treating gastroparesis due to this pro-motility effect. Intravenous erythromycin may also be used in endoscopy as an adjunct to clear gastric contents. More serious side-effects, such as arrhythmia and reversible deafness, are rare. Allergic reactions, while uncommon, may occur, ranging from urticaria to anaphylaxis. Cholestasis, Stevens-Johnson syndrome, and toxic epidermal necrolysis are some other rare side-effects that may occur. Exposure to erythromycin (especially long courses at antimicrobial doses, and also through breastfeeding) has been linked to an increased probability of pyloric stenosis in young infants (Maheshwai 2007). Erythromycin used for feeding intolerance in young infants has not been associated with hypertrophic pyloric stenosis (Maheshwai 2007). It can also affect the central nervous system, causing psychotic reactions and nightmares and night sweats (BCFI). Some of the erythromycins may cause complications in pregnant women and have the potential to cause birth defects (Ross-Flanigan 2004). Earlier case reports on sudden death prompted a study on a large cohort that confirmed a link between erythromycin, ventricular tachycardia, and sudden cardiac death in patients also taking drugs that prolong the metabolism of erythromycin (like verapamil or diltiazem) by interfering with CYP3A4 (Ray et al. 2004). Hence, erythromycin should not be administered in patients using these drugs, or drugs that also prolong the QT time. Other examples include terfenadine (Seldane, Seldane-D), astemizole (Hismanal), cisapride (Propulsid, withdrawn in many countries for prolonging the QT time) and pimozide (Orap). Theophylline (which is mostly used in asthma) is also contradicted. In 1949, a Filipino scientist, Abelardo Aguilar, sent some soil samples to his employer Eli Lilly. Eli Lilly’s research team, led by J. M. McGuire, managed to isolate erythromycin from the metabolic products of a strain of Streptomyces erythreus (later placed in another genus as Saccharopolyspora erythraea) found in the samples. Lilly filed for patent protection of the compound and U.S. patent 2,653,899 was granted in 1953. The product was launched commercially in 1952 under the brand name Ilosone (after the Philippine region of Iloilo where it was originally collected from). Erythromycin was formerly also called Ilotycin. In 1981, Nobel laureate (1965 in chemistry) and Professor of Chemistry at Harvard University (Cambridge, MA) Robert B. Woodward, along with a large number of members from his research group, posthumously reported the first stereocontrolled asymmetric chemical synthesis of Erythromycin A. The antiobiotic clarithromycin was invented by scientists at the Japanese drug company Taisho Pharmaceutical in the 1970s as a result of their efforts to overcome the acid instability of erythromycin. Belgian Center for Pharmacotherapeutical Information (BCFI). n.d. Erythromycin Belgian Center for Pharmacotherapeutical Information. Retrieved September 5, 2008. Keicho, N., and S. Kudoh. 2002. Diffuse panbronchiolitis: Role of macrolides in therapy Am J Respir Med. 1(2): 119–131. PMID 14720066. Lopez-Boado, Y. S., and B. K. Rubin. 2008. Macrolides as immunomodulatory medications for the therapy of chronic lung diseases Curr Opin Pharmacol. 8(3): 286–291. PMID 18339582. Maheshwai, N. 2007. Are young infants treated with erythromycin at risk for developing hypertrophic pyloric stenosis? Arch. Dis. Child. 92(3): 271–3. PMID 17337692. Retrieved September 5, 2008. Mims, C., H. M. Dockrell, R. V. Goering, I. Roitt, D. Wakelin, and M. Zuckerman. 2004. Chapter 33. Attacking the enemy: Antimicrobial agents and chemotherapy: Macrolides. In C. A. Mims, Medical Microbiology, 3rd edition. Edinburgh: Mosby. ISBN 0723432597. Ray, W. A., K. T. Murray, S. Meredith, S. S. Narasimhulu, K. Hall, and C. M. Stein. 2004. Oral erythromycin and the risk of sudden death from cardiac causes. N Engl J Med 351: 1089-96. Ross-Flanigan, N. 2004. Erythromycins. Pages 1231-1233 in J. L. Longe, The Gale Encyclopedia of Medicine, 2nd edition, volume 2. Detroit, MI: Gale Group/Thomson Learning. ISBN 0787654914 (volume); ISBN 0787654892 (set). Ross-Flanigan, N., and S. Uretsky. Erythromycins. In K. M. Krapp, and J. Wilson. 2005. The Gale Encyclopedia of Children's Health: Infancy Through Adolescence. Detroit: Thomson Gale. ISBN 0787692417. Trevor, A. J., B. G. Katzung, and S. B. Masters. 2005. Katzung & Trevor's Pharmacology: Examination & Board Review. New York: Lange Medical Books/McGraw Hill, Medical Pub. Division. ISBN 0071422900. This page was last modified on 6 September 2008, at 05:04.